It is that time of year—the festive festival season, and MONA's MOFO (Festival of Art and Music), has cemented itself as one of the do-or-die highlights of the New Year. The 2014 line-up is seriously grander and more eclectic than ever, with more than 200 artists performing across the spheres of sound, new media, dance, theatre, visual art and performance. 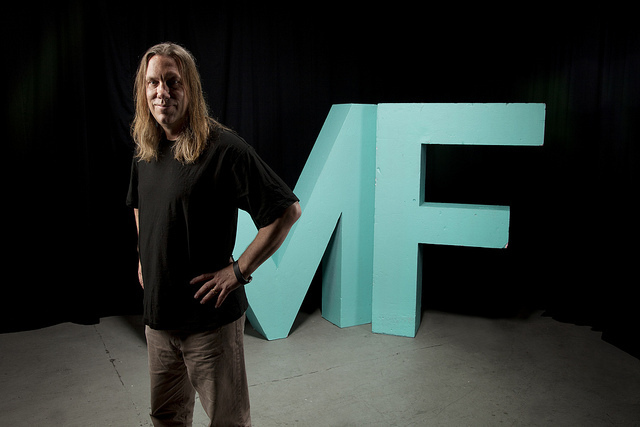 Brian Ritchie of the iconic rock band Violent Femmes has curated MOFO for the last five years, and this year he would really like to blow your mind. Currently on tour with the Violent Femmes in America, Brian made time to fill us in on all the MOFO highlights, on just why he relocated from NYC to Tasmania, and which Violent Femmes tracks are his sentimental favourites. The full MONA MOFO lineup will be released this Friday, and make sure you catch Rage this Saturday night the 30th of November on ABC TV, for Brian's awesome programming—there will be plenty of Lou Reed to be had. TUL: Over 200 artists, three orchestras, and art forms across the spheres of sound, dance, theatre, visual art, performance and new media—what informed your curatorial choices? Is there any kind of theme aside from 'chaos'? Brian Ritchie: Usually there are themes in every MOFO but I don't say what they are, preferring to let people discover for themselves. The desire to understand everything is strong but not conducive to being enchanted by the unexpected. You have to be open. My favourite experiences are when I don't know what's going to happen and get taken by surprise, so that's the curatorial approach. Ideally the artists, audience, and those of us putting it on all take a journey together. From a practical point of view, some of the work is commissioned for us specifically; others may be the brainchild of the artist but find their premiere with us. The rest is harvesting good local talent and the best of the artists touring Antipodes during our four or five days of party time. It's a juggling act. TUL: Which performances are you most anticipating? Brian: 'Struttin' With Some BBQ' by Australian Art Orchestra is something we've been talking about for years. It's a tribute or homage to Louis Armstrong. Most people don't know the breadth of Louis' influence and artistry. I'm particularly enthusiastic about that because it will also feature MOFO driven collaborations with Ngaiire, a lovely PNG/Aussie songstress, and Linzee Arnold, a Tasmanian graphic artist/drummer and Sabina Maselli, another visual artist. 'ADA' by Conrad Shawcross [pictured below] is another highly anticipated work, featuring a dancing robot and a number of world premiere compositions. This interprets the life of Ada Lovelace, a brilliant and visionary woman who predicted computer music over 150 years ago. TUL: Do you have any favourite exhibits at MONA? Brian: My current favourite is 'Berlin Buddha' by Zhang Huan. It is a gigantic Buddha made of incense ash pressed in a mold. The mold itself is a second giant Buddha. I am a practitioner of traditional Zen bamboo flute. As long as this work is at MONA I will be practising my flute there as often as possible. TUL: You moved to Hobart in 2008, what instigated the sea change? Brian: My wife, Dr. Varuni Kulasekera, and I desired to get out of the USA and become part of another place, at least one more time in our lives. After some thought, we decided upon Australia. When we received permanent residency, we decided to settle in Tasmania because it was the biggest change from where we had been, New York City. Our friends in New York thought we were insane, but now New York comes to MOFO and MONA. TUL: How did curating MONA MOFO come about in 2009? Brian: I had a studio at Salamanca Arts Centre and they wanted me to formulate a music and art festival for them. I came up with the blueprint and they showed it to David Walsh, MONA owner, and his marketing guy Leigh Carmichael, looking for funding. They were so enthusiastic they expressed interest in partnering on the project and that's how it became MONA MOFO. At that point MONA was still being constructed, so MOFO was the first big public foray for some of the MONA concepts. It was pretty exciting and caught the people by surprise. TUL: Tasmania possesses incredible natural beauty, do you have particular spots that you like to visit? Brian: You can't go wrong travelling around Tasmania and exploring nature. When Varuni was at the American Museum of Natural History we came down to Tassie to collect insects associated with waterfalls. When we saw Liffey Falls that's when we first thought of moving to Tasmania. This was 1996. So that's a sentimental favourite I suppose. TUL: Where would you recommend friends head to when in Hobart? Brian: I always tell them to check out MONA, TMAG (Tasmanian Museum and Art Gallery), the Tasmanian Symphony Orchestra if they're playing, and go to the top of Mt. Wellington. That's a beautiful vista. Then they have to come to our house for some BBQ. TUL: How is the tour going with the Violent Femmes? It has been a long time between tours; do things just click back into place? Brian: Femmes music is a feel thing. If you can feel it you can play it. The bass lines are actually fairly complicated, so it still presents a challenge to me. It has not been difficult to get back in the swing. We've only done six and half shows since starting up again, but astute listeners say we have recaptured it. TUL: 'Blister In The Sun' was an absolute anthem for me when growing up—what is it like when you hear one of your iconic hits in the everyday? Brian: It's always a real treat to hear our music in unexpected places. I've heard a marching band do 'Blister' at a basketball game, recorded versions at baseball, football, hockey and cricket. I've stumbled upon several bands doing covers of it, not knowing that I was in attendance. And of course you hear it on the radio or at parties. It's fun. Great that the music is still living 30 plus years later. TUL: With such a vast musical repertoire is there a particular album or song that you feel particularly proud of? Do you have a sentimental favourite? Brian: Of Femmes songs I suppose 'Never Tell' would be one of my favourites. I also love playing 'Add It Up', that song is a runaway train. I'm in another band called The Break with some of the guys from Midnight Oil and Hunters and Collectors. We have a song called 'Space Farm Suite' I'm particularly fond of. TUL: Which artists are inspiring you today? Brian: Of the pop artists the one that has attitude is Pink. She's always coming up with something new. A couple of the good young artists we have in MOFO 2014 are Ty Braxton, who is a composer/performer of prodigious talent, and Astronautalis, who has improvisational verbal skills of unusual quality. TUL: You are programming the upcoming edition of Rage on Saturday 30th November, can you tell us some of the best videos we should look out for? Brian: I picked the videos mainly on the basis of the thought that if I don't play them nobody might. I'm stoked to be able to play Robin Fox 'Sub Band Code' on national TV. I also featured Lou Reed for obvious reasons.